Our company has been manufacturing since 1964, launching many new and exciting products to the hair care / beauty industry. Advanced polisher technology has enabled us to formulate one of the most amazing, oil treatments ever. 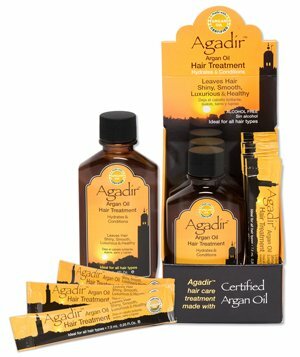 The oil used in Agadir™ Hair Treatment is Argan oil, which comes fro the nut of the Argan tree and grows only in Morocco. Our Argan Oil is 100% pure and certified. Agadir™ Argan Oil Hair Treatment is lightweight, non-greasy, instant absorbing… when applied to the hair detangles snarls, moisturizes and brilliantly shines dull, dry, drab hair. This alcohol free formula gives hair that silky, soft feel while smoothing and taming split ends. It’s easy to use… after shampooing, apply a few drops on damp hair. Comb through and style as usual. May be used on all hair types. Centuries old Argan Oil is now the “Wonder Oil” of the 21st century!